Stocks of South Korea’s solar energy-related businesses rose Monday on the latest reports that China might be mulling changes to a major solar power subsidy policy announced last year. A meeting between China’s National Energy Administration and companies involved in the solar energy industry took place last week and participants discussed whether subsidies for utility-scale projects would be renewed, reports said. 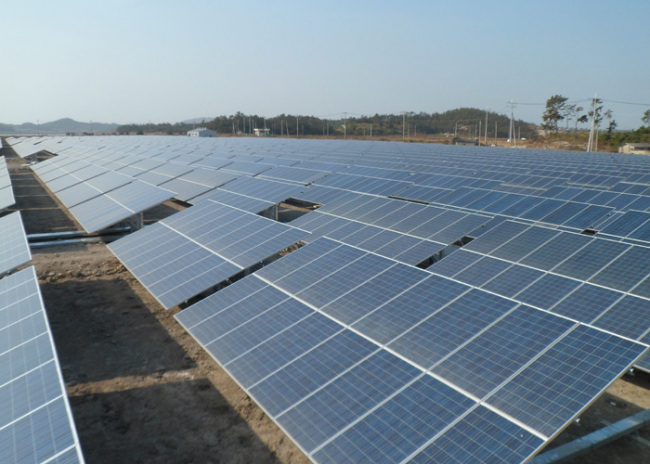 The subsidies were largely halted in June 2018, resulting in lower domestic demand within China and dealing a blow to Korea’s solar energy industry by depressing export volume as well as the prices of key components. Stock of OCI, the top producer of polysilicon, closed 4.9 percent higher from the previous day at 106,500 won ($95) per share on Korea’s main bourse Kospi. The firm, which manufactures the essential raw material needed for solar cells to convert sunlight into electricity, suffered an operating loss of 43.2 billion won in the fourth quarter last year. Share of Hanwha Chemical, which has a 100 percent stake in Hanwha Solar Holdings, closed 1.5 percent higher at 23,450 won. Kosdaq-listed firms such as SKC, TES and Iljin Power started with an opening gain, but most failed to maintain an upward momentum through the day. SKC and Iljin Power shares closed nearly 1 percent lower from the previous day at 39,350 won and 6,940 won, respectively. The firms manufacture and deliver equipment for solar panels and cells. “The Chinese government’s policy toward solar energy is expected to further relax,” said Kim Jin-young, an analyst at Kiwoon Securities. China is expected to allocate about 3 billion yuan ($443 million) worth of fixed subsidies for solar energy in 2019, according to the nation’s state-run Global Times.